The Future Awards 2009 have come and gone but the impact continues to resonate. Months of planning and voting all culminated in a glamorous and exciting awards ceremony on the 18th of January 2009 at the Muson Centre in Lagos, Nigeria. As per tradition, the red carpet was rolled out - stars including Omotola Jalade-Ekeinde, Stephanie Okereke, Omowunmi Akinnifesi, Gbemi Olateru-Olagbegi, Tara Fela-Durotoye, Funlola Aofiyebi-Raimi, Teju BabyFace and Ali Baba walked and posed as cameras flashed. The show kicked off with Idols West Africa winner, Timi Dakolo performing his brand new single 'Let it Shine'. The hosts for the evening, musician Darey Art-Alade and Soundcity TV's Onyinye Igwe then took the reigns and got things rolling. The evening's entertainment was a blend of music, inspiration, dance and drama as a melange of acts including musicians Lara George, Omawumi, Obiwon, J Martins, Midnight Crew, MI, Lil' Flo; dance acts Explicit, DNDMT (Dance Na D Main Thing) and the theatre trope from TerraKulture all performed during the show. 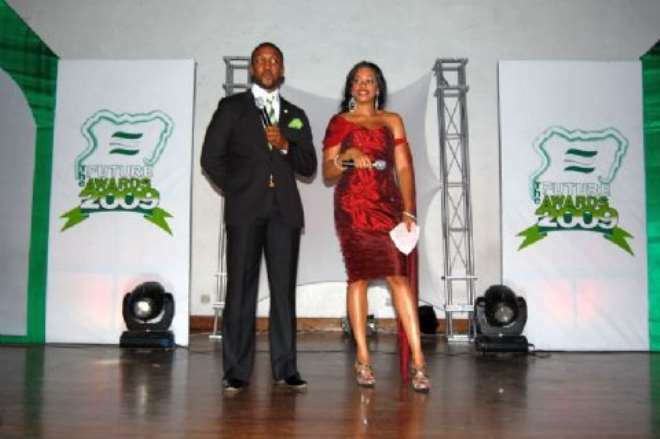 Nominees stood by with bated breath as the winners of the various categories were announced. Eventually, 18 individuals and 2 teams joined the Future Awards Class of '09. Winners, photos and details below! THE FUTURE AWARDS 2009 WINNERS!! !